Egypt Life on the Nile: Jobs - HISTORY'S HISTORIESYou are history. We are the future. 3. Government: How do humans organize their societies? What was it like to be a king in ancient Egypt? Well, for one thing, if you were Pharaoh, you would be a god. A pharaoh had absolute power over everything and everyone. No one could argue with you. No one could yell at you. No one could even call you by your name. They did not call you “the pharaoh,” but simply Pharaoh. If you were Pharaoh, you would own everything - the ground, the plants, the crops, the people, the people’s homes, and all the crafts created by the people - everything would be yours. People could use things as long as you let them, but you would be the actual owner. If you wanted something done, you would simply tell your assistants and they would see that it was done. If you wanted something built, your assistants would see to that, too. Of course, that sounds nice. It was, however, a tough job to be a pharaoh, one that had the great weight of massive responsibility. Since you owned everything you had a lot to take care of. Luckily, the people - people whom you also took care of - were happy to respond by helping take care of you. Everyone in Egypt knew that it was their job to help Pharaoh take care of Egypt. Basically, everyone worked for the state. In a way, ancient Egypt operated very much like a modern socialist state. For this lesson, you will learn a bit what it was like to work in ancient Egypt. In doing so, you will learn a lot about what it was like to live in ancient Egypt. Peasants: The native born Egyptian peasant was not a slave. He was a serf. He was bound to the service of his master and his master’s land. His master could be a nobleman, a pharaoh, or a temple. At the same time, a serf could possess land and property of his own. Since the masters of Egypt had a belief in fairness and in justice, this system worked for everyone. Most peasants were farmers. Some accepted employment in the homes of the rich and noble as nannies or servants. All peasants were paid for their work. As a way to escape working during the hottest hours of the day, peasants, along with most of ancient Egypt, took breaks for mid-day siestas. During their mid-day siesta, peasants ate and drank. After siesta, it was back to work until dark. They had a lot to do. They had their master’s garden to tend, along with their own. They took care of the beehives and the cattle. They caught fish and birds. They were busy, but there was always time to enjoy one of the many festivals put on by the priests, paid for by their masters, for their entertainment. If a peasant had the money, he could buy his wife a linen dress. Peasants had private homes of their own. They had children they loved and enjoyed. They spent time with their family. The peasant’s life was busy but contented. While they waited for the flood waters of the Nile to recede each year, every adult male peasant had to enroll in a work gang. During this period, they were expected to give a certain number of days of labor to public works programs. They might be assigned to fix the canals, or to work on the roads, or to replace the boundary stones between properties in their proper location. 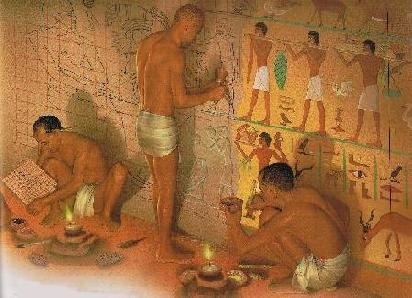 Some peasants also signed up to work on the pyramids. This system was agreeable. Laboring on public works projects during the Nile's flood season ensured steady pay throughout the year. ​Of all their jobs, the two most important were the planting and the harvesting of crops each year. Many magic spells were spoken. Many religious festivals were held. At the earliest possible moment, when the Nile receded and the land had dried out enough but not too much, the peasants planted the fields. When the crops were tall, the peasants spent long hours in the fields, bringing in the crops. Occasionally, peasants got into trouble. They stole or they cheated on their taxes. When that happened, the hated police came and took them to court. If they were found guilty, they might get off with a warning. Or, they might get a beating by the police. They could have their nose cut off, but that almost never happened. Their crime would have to be very bad to receive a punishment like that. Because peasants were important to the welfare of all Egyptians, magistrates were merciful. The peasants knew that their jobs were important to all of Egypt and it gave them great pride to do their job well. Peasants in ancient Egypt were respected for the work they did. They were paid for the work they did. And, they were thanked by the pharaoh, by their master, and by the gods for the work they did. Peasants whose hearts were light could dwell forever in the afterlife, just like everyone else in ancient Egypt. Brainbox: Why do you think everyone thanked the peasants? Artists: While ancient Egyptian art is remarkable for its originality and beauty, as well as for the influence it had on the art of other civilizations around the Mediterranean, especially the Greeks, Egyptian artists were considered to be craftsmen rather than artists. They were not given the honor due their work. While we often think of as artist as one who toils away alone in the service of a muse, the ancient Egyptians perceived artists - and the artists perceived themselves - as one of a group. In order to make a statue, for instance, you needed a whole team of craftsmen. First, a stone-cutter had to cut the stone. Then a stone-hauler hauled the stone. Then, you needed a sculptor to sculpt the stone. When the sculptor completed his work, the statue had to be delivered to the artist who specialized in cutting hieroglyphs in stone. That artist added the owner's name and descriptions of the owner's achievements to the statue. To make the statue as lifelike as possible, the statue was then transferred to the artist who specialized in coloring. That artist painted the statue. Finally, the sculpture was ready for delivery to its owner. Each member of the team was paid, but no one received recognition for his work. What was important was that the statue was the best statue you, collectively as part of a team, could make. ​What was the most important job of an artist? Most statues were ordered for tombs, so it was doubly important that each statue should look as much like the owner as possible. This was to avoid confusion. A man’s name was not just a label. It was the man himself. If his name vanished, so did he. To an ancient Egyptian painter, working on a tomb wall, the easiest way to represent 100 people was to simply paint 100 people in organized rows so they would be easy to count. That’s what they did, and they did it beautifully. In spite of the low esteem in which artists were held, their art was magnificent. The surviving statues show us how people looked, and the surviving tomb paintings are vivid pictures of the real everyday life in ancient Egypt. These painting and statues show us the ancient Egyptians at work, at play, in their homes, in the city, and in the country. They show us their incredible love for life. Brainbox: Why do you think artists did not take credit for their work? Soldiers: Other countries did not want to send their armies marching across a vast desert to finally reach ancient Egypt and start a battle. In the beginning, thanks to Egypt’s natural barriers, Egypt had little need for a huge army. During the Old Kingdom, provinces, instead, had local armies whose purpose was to solve local problems. Why did the Egyptians need an army? Natural barriers did not totally protect them, however. The Egyptians needed extra protection in the eastern Delta region and in the south. They built fortresses in the eastern Delta region, and they built a line of fortresses in the south to protect them from their African neighbor, the Nubians. During the time period of the Middle Kingdom, pharaohs created a properly trained central army led by commanders. The pharaoh was in charge of the army and served as commander-in-chief. The pharaoh’s war helmet was bright blue. The army was always looking for new recruits “to support the blue.” When they did not have enough people enlisted in the army, the royal recruiting officer went to each of the local villages. He “recruited” one man from every ten into compulsory service. Being required to serve in the army upset a lot of the population. Recruits usually came from the peasant class. The Egyptian peasant was a peaceful soul. Forcing him to join the military was unpopular as well as ineffective. The peasants were not fighters. They were farmers. The thought of spending years locked up in a barracks, marching up and down to the sound of a trumpet, was not a happy thought. They would rather work in the fields. Sure, it was hard work, but it was work that mattered, and it was close to home. As a result, during this time, the Egyptians lost a great many of their battles. What does the ability to speak out against the military without fear of punishment shows that the ancient Egyptians had? The schoolteachers often spoke out against the military as a career choice for their students. Believe it or not, teachers were quite outspoken. Of course, that was a good thing. It shows the Egyptians enjoyed a good deal of freedom of speech. Teachers, wanting the best for their students, knew how tough military service could be. In an effort to get their students to apply themselves in school, they would frequently tell horror stories abut the military service that awaited a student who performed poorly. One of the stories they told was about a poor soldier who wrecked his chariot just as the commander was making an inspection. First, he was whipped until he was a bloody mess. Then, he was forced to march over the mountains carrying a heavy backpack. The pack was so heavy that it broke his back. He had to drink foul water, because he was too far away from the Nile. He received almost nothing to eat because he was too far away from the grain storage to pull his fair share. Finally, at last, when he was allowed to return home, he had to come home tossed over the back of a donkey because his legs no longer worked. On the way home, he was set upon by bandits who stole his pay and his donkey. There was nothing left for him but to crawl all the way home to the Nile. Poor soldier,the teacher reminded his students, what a life he chose for himself. Scribes: Perhaps the ancient Egyptians were not the best of soldiers, but they were fabulous administrators. The Two Lands became great, not from battle, but from their ability to manage large territories and large numbers of people. That order was provided by their scribes. Scribes knew how to read and write. If you were a scribe, you did not have to row a boat, or work in the fields, or carry a basket. Your job was to write everything down. The profession of scribe held great prestige. Some of the peasants could read and write, but most could not. To show how important they considered reading and writing, noblemen, princes, and even the pharaoh had artists depict them sitting cross-legged with a scroll of papyrus paper. You could learn to be a scribe, and if you became one you would have many job opportunities. As a scribe, you could enter the royal service or the temple service. You could work for a provincial nobleman, or serve a senior administrator, or serve the courts. You could become an authority on tax, or train as an engineer or as an architect. In a world in which jobs were inherited it was almost impossible to move up the social scale. Scribes were the exception. Scribes were definitely upper class or, at the very worst, upper middle class. The same schoolteachers who told horrible tales about the life of a soldier encouraged their students to become scribes. They told their students that if they became a scribe, their hands would be soft, their presence treated with respect, and they could wear a white robe to show that they were not a peasant. How did one become a priest? Priests were some of the busiest people in ancient Egypt. Not only did they work to meet the spiritual needs of the people, they were also recognized as healers, the ancient Egyptian equivalent of a doctor. Priests were highly respected for their ability to heal. In fact, they were so highly respected that if you were to get sick in the ancient world you might hope that you got sick in ancient Egypt. In addition to being healers, of course, priests were religous leaders. People were not afraid of their gods or of their highly respected priests. The temples were places where religious ceremonies were held. They were also schools, universities, libraries, and centers of administration, as well as workshops, farms and granaries. The Egyptians loved their animal-headed gods. They did not find them frightening. They found them comforting. The ancient Egyptians treated their gods almost as one of the family. Home Life: Priests were married. They had families. Often, homes for the priests and their families were part of a temple complex. That way. they were always close to their work and could more easily take care of their many responsibilities. Some of their duties included working in the fields and tending to the temple's beehives. They also made daily rounds of the people who could not come to the temple because of illness or age. It was not easy to become a priest. Like other jobs in ancient Egypt, priesthood was handed down from father to son. The Daily Rite: One of the most important jobs of the priests was the Daily Rite. The Daily Rite was performed in the capital and in every temple along the Nile. Here’s how it worked: There was a door into the shrine where the statue of the god was displayed. At night, the door was closed and a clay seal was fixed to the door. In the morning, accompanied by assistant priests and female singers, the clay seal was broken and the door was opened. The head priest removed the statue from the shrine and offered it food, just as a child would pretend to feed a doll. They robed it in royal clothes, and rouged its cheeks. The statue was then replaced in the shrine. The door to the shrine was sealed again and everyone left the room walking backwards, sweeping a wide palm leaf over the floor to remove any footprints they might have made on the sandy floor. ​Festivals: Priests were also responsible for local festivals. Festivals were joyous, high-spirited affairs filled with music and laughter. At the festival, bright banners advertised goods for sale and vendors hawked food and souvenirs. Festivals were held frequently and were always well-attended. At the center of the celebration was the statue of the god associated with the temple. The statue would be taken out of the temple and, in parade style, was carried by the priests up and down the streets of the town or city. Accompanying the statue, the attending priests wore bird and animal masks while female musicians shook rattles. Funerals: The priests were also responsible for the process of getting bodies ready to move on to the afterlife. They directed the burial ceremonies, including mummification and the reading of chants and spells from The Book of the Dead, before leading the procession to the tomb. At the tomb, the priests conducted the opening of the mouth ceremony. That was the ceremony that the ancient Egyptians believed would restore the ability to eat and drink in the afterlife to the deceased . In the provinces of Egypt, who was in charge of governing? Several million people lived in ancient Egypt. It was a big place to manage. The pharaoh was in charge of everything. He was the head of the military, the top priest, the head of government, and the main farmer. In reality, however, the pharaoh had lots of help. Lots. He had an organized army, a police force, and a huge number of ministers and government officials who all reported to their own boss. Their boss reported to the pharaoh’s right hand man, the vizier. And, the vizier reported to the pharaoh. Nomarchs: A pharaoh’s palace was not only his home, it was the seat of government. Many officials had offices in the palace. Many others had offices in the nomes. The country of Egypt was divided into provinces, which they called nomes. There were about 20 nomes in Lower Egypt and a little over 20 nomes in Upper Egypt. Each nome (province) had a nomarch in charge. Nomarchs were not elected. They were appointed by the pharaoh or by the vizier in the pharaoh’s name. Typically, the nomarch was a member of the royal family. Overseers: Each nomarch had many senior and middle-ranking officials to help them run the local government. Those officials were called overseers. Overseers also had people to help them do their jobs. At each level of government, officials employed scribes to help them with the royal archives. The archives were important to the ancient Egyptians. They are equally important to us and have greatly served to further our understanding of the life the Egyptians enjoyed along the Nile thousands of years ago. Everything in ancient Egypt was written down and recorded - wills, deeds, tax lists, court results, journals, letters, memos, regulations, inventories, notes from meetings - everything. Everything they wrote down was sent to the vizier, to be reviewed, and ultimately to be included in the archives. The vizier, who reported directly to the pharaoh, was responsible for seeing that the archives were up to date and accurate. But that was only one of the vizier’s many jobs. ﻿Vizier: Next to the pharaoh, the most important person in ancient Egypt was the vizier. Everyone reported to the vizier. In turn, the vizier reported to the pharaoh. He had a huge staff of scribes and assistants to help him do his job well. The Egyptians loved titles. They gave themselves a string of titles, very impressive titles that were, for the most part, quite meaningless. Some of the princes called themselves viziers, but they did not do the job of a vizier. They just liked the title. The real viziers acquired such a reputation for honesty, integrity, wisdom, and dedication that they were often permitted burial in the Valley of the Kings and were, in later years, worshiped as gods. Their job, however, was not to be a god. Their job was to deal out justice. Well, I guess that's not too different from the job of a god after all. What was the vizier's daily report to the pharaoh about? The vizier had to submit a daily report to the pharaoh. The vizier's daily report contained details about the entire state of Egypt. The report included everything that the vizier had done and learned that day. One of the vizier’s many jobs was to hear court cases that had not been settled in lower courts. In order to hear complaints from the people, Egypt had three lower courts. Sometimes, no matter how hard everyone tried, people still wound up unhappy with the decision of the lower court. If that turned out to be the case, the people had the right to come before the vizier and be heard. One of the rules was that cases were taken in order - first come, first served, no exceptions. Another rule was that everyone had rights. Everyone. The vizier could not send away anyone unheard. He had to listen patiently and carefully to each complaint. Once the vizier announced his decision in a case, he had to explain why he made that decision to the audience. The vizier’s day was not done. On a typical day, he might meet with a governor of one of the many nomes. That meeting might be followed by a meeting with a visiting diplomat from a neighboring tribe or country. He might study the tax collection receipts and create a report for pharaoh. He might check into the latest repair needs for one of the many canals that held precious water. Before he could go home to his family and relax, the vizier still had to put in several hours catching up on all his paperwork. Who were the nobles and administrators? Relatives of the pharaoh were considered nobles. Nobles had jobs. People were not allowed to be lazy in ancient Egypt. Some nobles worked in civil service as administrators. Some administrators were high officials, who, over time, achieved the same social status as a noble. It was important to work because jobs were inherited. Families were known for the job that they did. If you were a baker, your sons would most probably become bakers and all your kids would work in the bakery. The ancient Egyptians did not like change. The goal was not to find a different job, but to do the job for which your family was known and to do it well. Did the system work? The ancient Egyptian system for organizing their society worked really well. However, Egypt was huge and, from time to time, some problems emerged. In each of the nomes, a noble was the head of local government. In their province, they were the top dog, and some of the nobles acted like little pharaohs. Some of the provincial nobility were more concerned with building their own tombs than they were with the comfort and security of their people. That sort of neglect led to problems and in some cases it led to war. Other local administrators, however, were very proud of the job they did on behalf of the people. Ameni, who was a nobleman ruler of Upper Egypt was, as he said, proud that his subjects had enjoyed perfect justice, that the poor and widows had lived in perfect security, and that he had abolished poverty and looked after agriculture so perfectly that no one had gone hungry, even in the days of scarcity. What is another name for a pharaoh? Pharaohs: Pharaoh is another name for king. As very small children, pharaohs were allowed to run and play with their friends. That sense of freedom and fun did not last very long, however. The job of running the country of Egypt fell on a future pharaoh's shoulders quite early. Some remarkably able, fair, patient, far-sighted rulers ruled Egypt. The kings of Egypt might have been looked upon as gods. If so, for the most part, they proved to be hard working gods. Pharaohs married when they were very young, usually in childhood. The people believed that a pharaoh was an actual blood relative of the sun god Ra. To keep the god’s blood pure, pharaohs had to marry within the royal family - their sister, or perhaps their aunt. This was true only for pharaohs. No one else was allowed to marry someone that closely related to him or her. For mortals, that relationship would be too close to produce strong children for Egypt. Pharaohs and their families were exceptions. Like a shepherd with his flock, the pharaoh's responsibilities could be broken down into two big categories - peace and protection. As a result, the sign of the pharaoh was the crook and the flail. The crook represented his responsibility to guide his flock. The flail, a small, multi-tailed whip, represented his ability to meet out justice to friends and enemies alike. By doing so the pharaoh protected his flock and ensured the future prosperity of Egypt. Essentially, The crook and the flail were symbols of power. 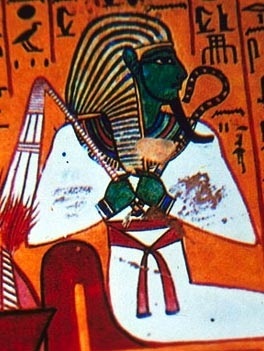 Since the crook and flail were also symbols for Osiris, the king of the afterlife, they also served as reminders that pharaohs were related by blood to Ra’s grandson, Osiris. These symbols helped to show their respect for their blood relation, and helped to emphasize that pharaohs were gods. A pharaoh inherited the throne though the female line. It was the Queen Princess who inherited the throne. Her husband or her son, however, would rule. If she died, the next Queen Princess in line took over, and her husband or son would rule. To solve this, the first thing a new pharaoh did was to marry any woman who seemed to have even a remote chance of inheriting the throne. Since Pharaohs typically had several wives and lots of kids, the throne was safely handed down to someone in the family for generations, creating a dynasty of rulers. A dynasty is another name for a single family of rulers. Over 3000 years, Egypt was ruled by 31 dynasties. Here are just a few of the many Pharaohs who ruled Egypt during the 3000-year period when Egypt was ruled by dynasties. Around 3000 BCE, King Narmer, who ruled Upper Egypt, conquered Lower Egypt. King Narmer combined the two countries into one new country called Egypt. The sign for Upper Egypt was a red crown. The sign for Lower Egypt was a white crown. King Narmer combined these two signs to make a Double Crown - white inside red. He established Egypt's first dynasty. The dynasty system continued for the next 3000 years. Hatshepsut's husband’s son by a minor wife inherited the throne of Egypt when he was only a young boy. Because of his age, Hatshepsut was appointed to serve as his regent, a sort of helper. They ruled jointly for while. Tired of sharing, around 1500 BCE, Hatshepsut crowned herself Pharaoh. Egypt had never had a female Pharaoh and they did not like it much. Hatshepsut, however, ignored the people. She dressed in men’s clothing and ran the affairs of the nation with the full support of the priests. Hatshepsut is known as having been a good ruler who greatly expanded the Egypt through trade rather than through warfare. When her stepson, Thutmose III grew up, he led a revolt to reclaim the throne. Hatshepsut disappeared. Thutmose had her statues and temples and buildings mutilated. Akhenaton was very strange. He decided that a god named Aten should replace Amon as the most important God in ancient Egyptian religion. In fact, he built a whole new capital for Egypt devoted to the worship of only Aten, thereby creating the world’s first monotheistic religion. No one could stop him because, after all, he was Pharaoh. He also changed Egyptian art. Moving away from the highly stylized art practiced for thousands of years, Akhenaton favored more realistic art. The people were not pleased. Neither were the priests. After Akhenaton died, his monuments were destroyed and, to make sure he was erased from existence and could never live in the afterlife, his name was removed from walls and statues. Still, his son, King Tut, became the next Pharaoh. ​Ramesses lived to be 96 years old. He did not have to worry about running out of sons to take over after he died. He had 200 wives, 96 sons, and 60 daughters. He ordered a great many monuments to be built in honor of him. The temple at Abu Simbel is a great example. This temple has many huge statues of Rameses II. The little statues at his feet, about the size of his big toe, are tiny statues of some of his wives. Looking at Ramesses’ many monuments, you can easily see which person he believed was the most important person in the world. Of course, the answer is Rameses II! While he was powerful, perhaps his greatest achievement is in his signing of one of the wold’s first peace treaties. After battling the Hittites for fifteen years and fighting to a draw, Ramesses signed a declaration of peace that lasted for the remainder of his reign. Ramesses being Ramesses, the first thing he did after agreeing to the terms of peace was have the treaty carved on the walls of a temple, giving himself credit for the accomplishment, of course.